It’s already October, and still warm and nice. The cats are mostly outside, and Ruffi The Ruffian, our big red tom cat, comes in only when he pleases – he is the only one who can’t be bribed by food. My thoughts are already on my upcoming trip to Hamburg, to see my family and friends, and my desk is covered with even more papers than usual: it’s high time for the taxes, and I’m procrastinating. The A(vid) B(akers) C(hallenge) for October was another welcome distraction. 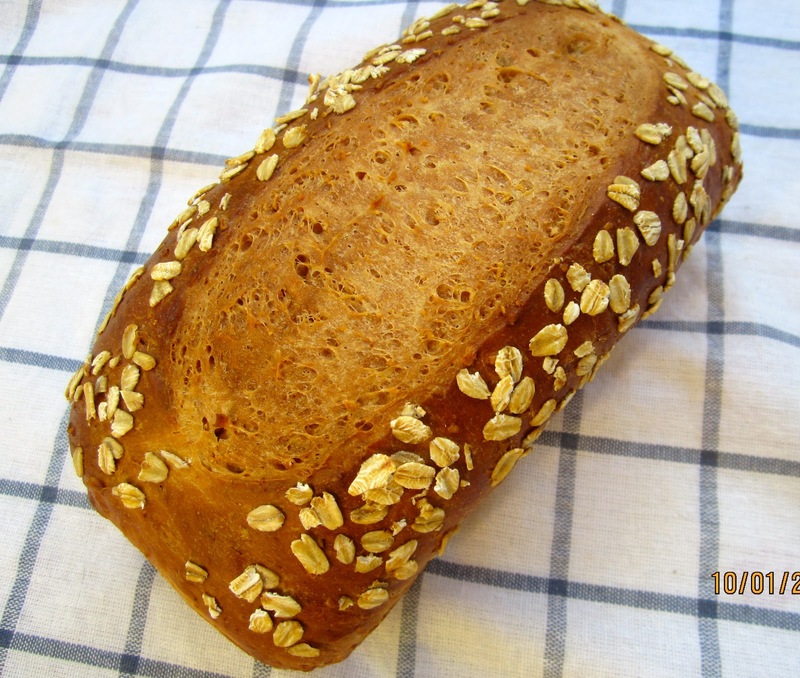 We are baking our way through Abby Dodge’s “The Weekend Baker”, and this month’s recipe is “Honey Oatmeal Bread”. Following Abby’s do-ahead option of mixing the dough the day before, then letting it slowly rise overnight in the fridge, was a no-brainer – I do this with almost all of my breads. You do most of the work the day before, the dough rises while you are sleeping, and, as additional benefit, the taste improves if you give it more time to develop. I had read about some other bloggers problems with the bread getting too dark in the oven, and there is nothing wrong with your ovens or your baking abilities. The given temperature, 375º F, is simply too high! According to master baker Peter Reinhart, rich breads with milk, eggs, fat and sugar are best baked at 350ºF, and that works just fine! Looking at the list of ingredients I stumbled over the staggering amount of sweetener. Okay, this is supposed to be a HONEY oatmeal bread, but 1/3 cup? Though I adapted somewhat to Americans’ Love of Sweet during my eleven years as a Mainer – I now can eat pancakes with syrup – my stubbornly German stomach still revolts against a really sweet bread. A bread is a bread – and not a cake! I want to eat it with ham, cheese or salami. And if I want it sweet, I put honey (or jam) on it, not in it. I reduced the amount of honey by half. 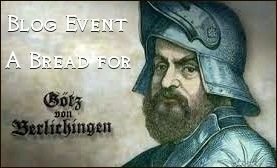 From my experience I know that you can safely reduce the amount of yeast in many recipes (even in Peter Reinhart’s), especially if you let your dough rise slowly in the cold. 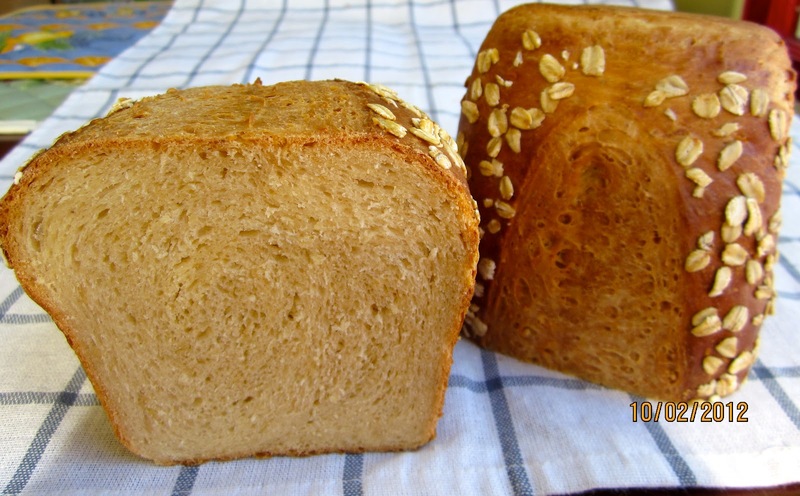 2 1/4 teaspoon/7 g instant yeast are not necessary, 1 1/2 teaspoons/5 g are enough, even for a rich bread like this. Instead of long kneading I prefer the elegant stretch and fold technique. Even very sticky doughs can be handled – and tamed – with ease, and develop beautifully. 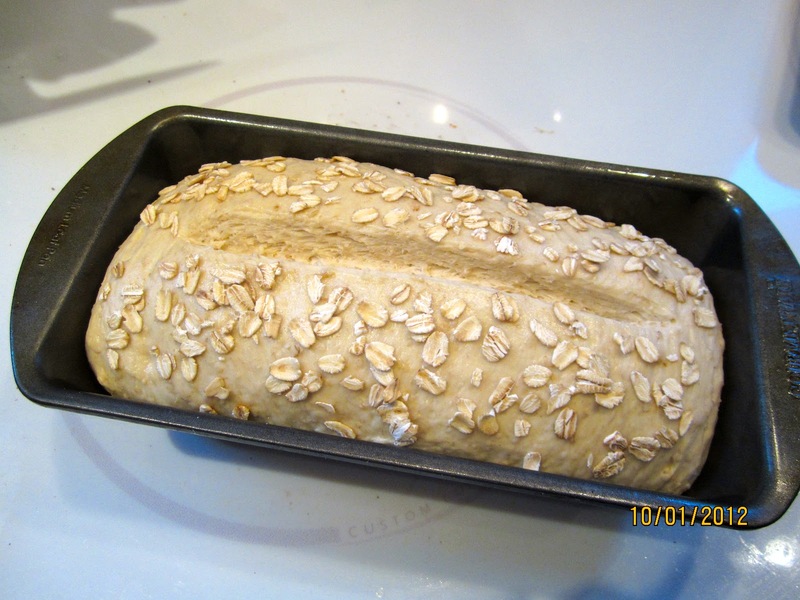 And, instead of brushing the baked bread with melted butter, I applied an egg wash – with more rolled oats as topping. Place measuring cup with milk in the microwave and bring to a boil. Stir in oats and butter, and let sit for 20 minutes, stirring once or twice. Stir in instant yeast and honey, until well combined. Add milk mixture to flour and salt in mixing bowl. Stir on low speed for 1 – 2 minutes (or with wooden spoon) until all flour is hydrated and shaggy mass forms. Let dough rest for 5 minutes. Transfer dough to lightly oiled work surface. Pat in a rough rectangle. With wet or oiled hands, stretch and fold dough in thirds, like a business letter. 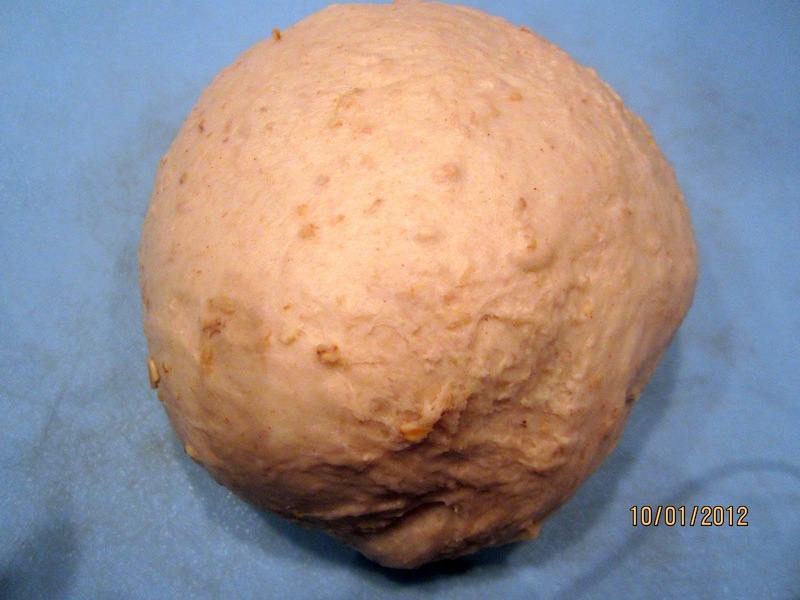 Gather dough into a ball, tucking the sides underneath, and place it, smooth side up, into a greased bowl. Cover, and let rest for 10 minutes. Repeat these stretches and folds (S & F) 3 more times, at 10 minute intervals. 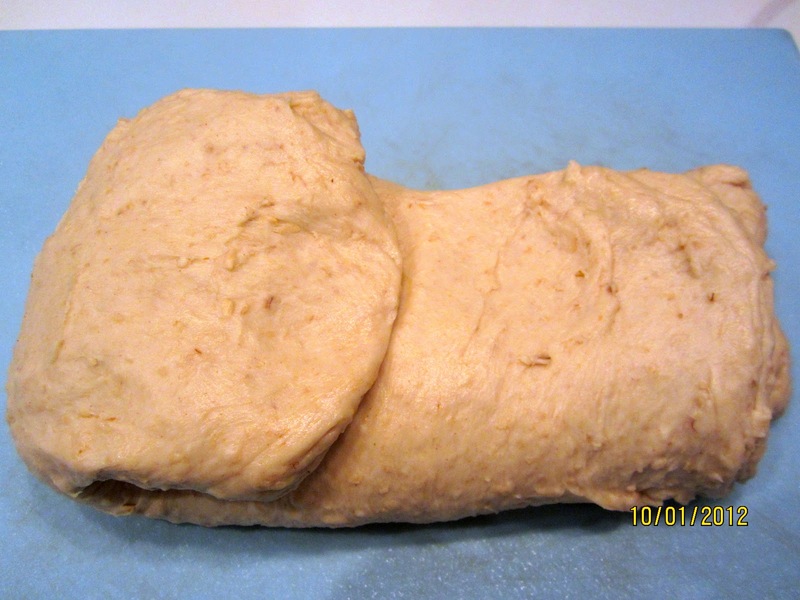 After the last S & F, place dough in an oiled container with lid, and place in refrigerator overnight. 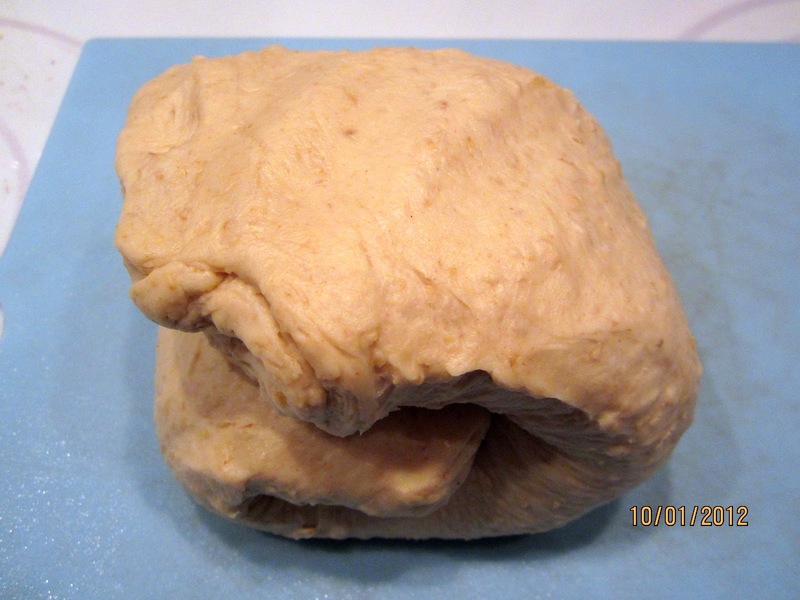 Remove dough from fridge 2 hours before using, to warm up. Lightly grease 8 1/2″ x 4 1/2″ loaf pan. Transfer dough on clean work surface. Placing your hands in the middle, gently press down to degas. 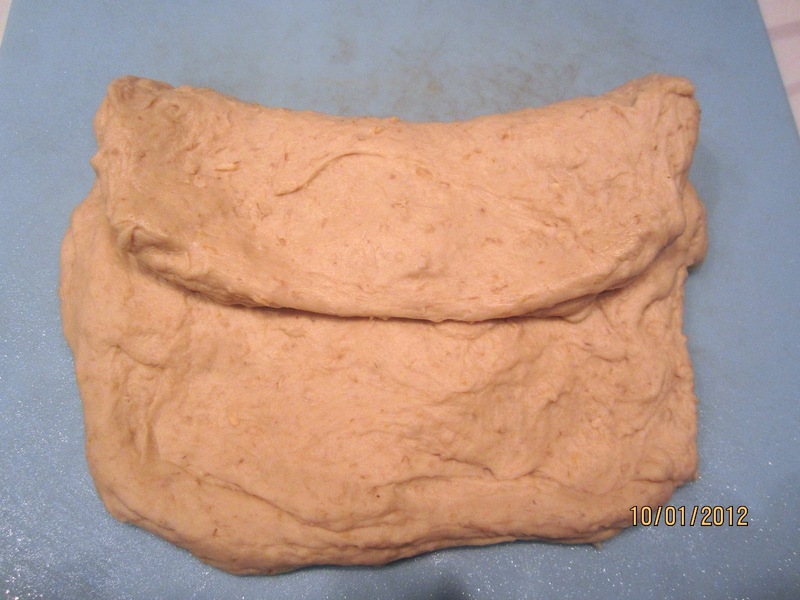 Pat dough into a 7 x 10-inch rectangle. Roll up into a sandwich loaf, pinching seams to seal. 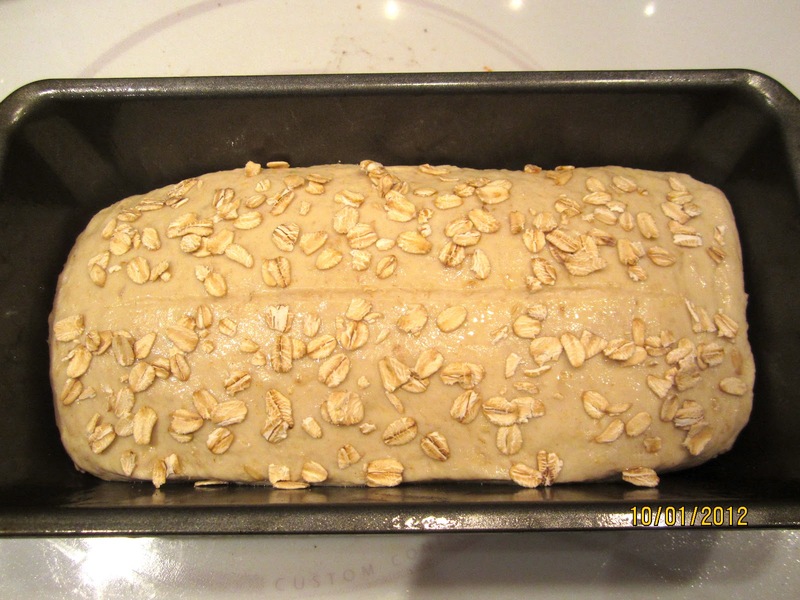 Place, seam side down, in prepared loaf pan, then gently flatten with your hands to even it out. Brush top with egg wash. Using sharp knife, slash lengthwise. Sprinkle with rolled oats, then gently press with your hands to make sure they stick to the dough. Refresh the scoring if you want the slash to open wider during the bake – I do. Place bread in the middle of the oven, reduce temperature to 350ºF/175ºC, and bake for 20 minutes. 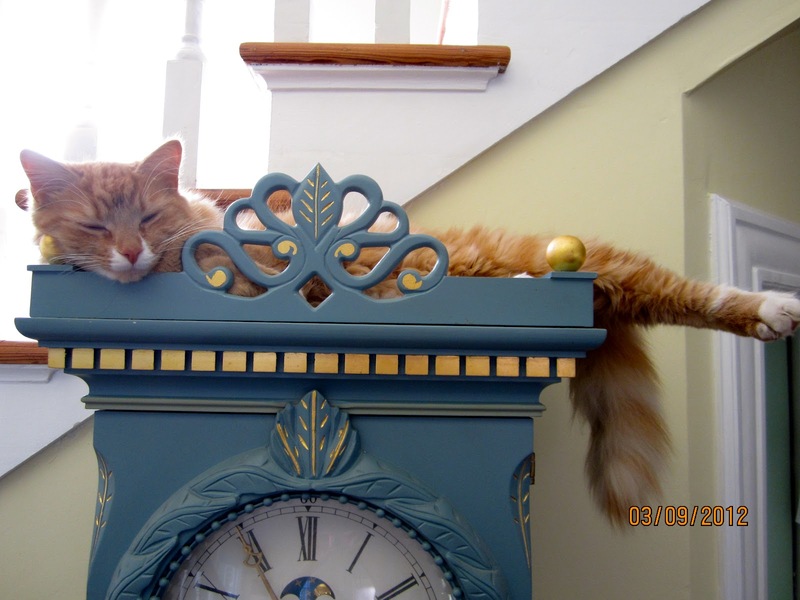 Rotate loaf 180 degrees for even browning, and continue baking for another 20 – 25 minutes, until top is golden brown, and it registers at least 195ºF/90ºC. Remove from oven, turn out onto wire rack, and let cool. We had the lovely looking loaf, toasted, for lunch. It was still mildly sweet, but its taste blended harmoniously with Black Forest ham, as well as with my Rose Hip Jam. Next time I bake it, I’ll substitute 10% of the white flour with spelt or whole wheat, to add a little more heartiness. And if you would like to join us, go to Hanaâ’s Kitchen, and check out what comes next. Previous Post ROSE HIP LEVAIN – MADE FROM JAM! Lovely loaf, Karin!!! I love the oats on top. Great blog post. 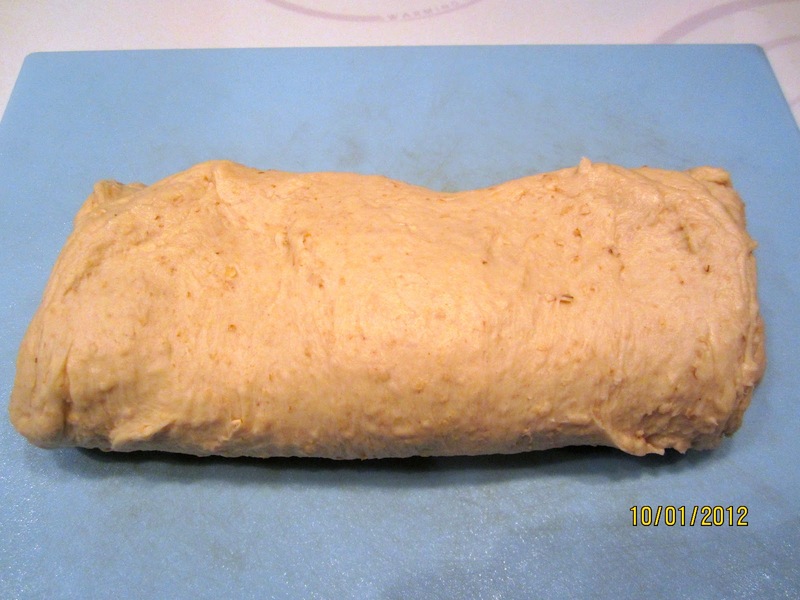 I'm jotting down “slash” dough after shaping and again after the final rise. I think that will help create a good “slash” and reduce the chance of butchering the dough right before baking (because of the existing “mini slash”). I'm also writing down baking this bread at 350F next time. I liked the sweetness from the honey in the bread but did feel like I was eating “dessert” rather than bread, ha ha. I also found that making a “mini slash” helps with the distribution of the topping, especially with larger seeds or flakes. If you sprinkle them on and score afterwards, your knife snags all the time because they are in the way. I often use egg wash with rolled oat, rye, or spelt flakes as decoration – it just looks so pretty. Your breads look wonderful! I like how you show a clear picture of the cut loaf. I think a crumb shot is important, too, because you can see the structure of a bread.